Traditionally rice milk was made through the process of fermenting rice (like Amazake) and diluting to taste. Today rice milk is made by emulsifying oil, rice, water and rice syrup or sugar (unless unsweetened). The oil makes it taste rich and gives the illusion of body. Traditional rice milk is mostly rice, fermented to make it a bit sweet and more digestible. Give it a shot and see how you like it! First, make a batch of Amazake (see recipe). Once Amazake is made, blend 2 cups of amazake with 1 cups water. Add little bits of water until desired sweetness and consistency is reached. Strain it through a cheese cloth. Bring it to a boil and bottle hot. This rice milk keeps in the refrigerator for up to 4 months if unopened. I like bottling it in quart mason jars. We can use up a quart quite quickly as it is best consumed within a few days after opening. I love real rice milk and Amazake as well. Too bad I don’t live close to ‘Rhapsody’, otherwise l would frequently buy both of them from you; it is time consuming to make my own. Thanks Esther! 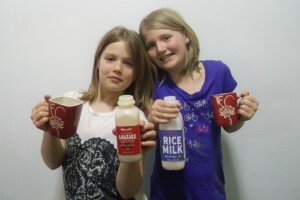 If you are located East of the Mississippi River you can order our Rice Milk and Amazake online. Check out our online store! Thanks for posting the info on koji, amazake and rice milk. A local grocer ordered koji for me to make amazake, unfortunately it was shiro koji, which has a lot of salt added to it, so I think the amazake will not turn out correctly, I will have to order more koji! I guess this is a learning process!